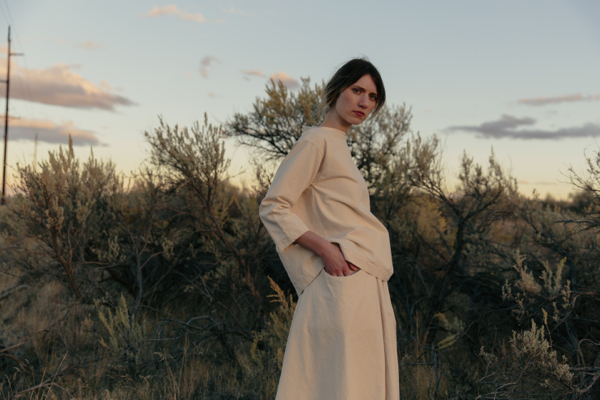 Elizabeth Suzann has just released another strong collection—this time full of cold weather staples that will be available year-round. Perfect for both chilly summer evenings and crisp winter days, this core collection of garments feels timeless, versatile and functional, just as I would describe every other piece I own from the Nashville brand. I am especially excited about the origami-inspired lines of the new Astral Vest, Crossover Dress and Top. This subtle layered detail can be tucked into the V in the back, or worn out for more of a cape-feel. Liz has also simplified and improved her supply chain, opting for all locally woven wool fabric from Tennessee Textile Mill, and wool yarn sourced from Oregon's Imperial Stock Ranch (where these stunning images above were taken by Zachary Gray). P.S. Have you seen the stunning Cocoon Duster Vest that she hand-dyed and made specially for Goodwin? There's only one left!